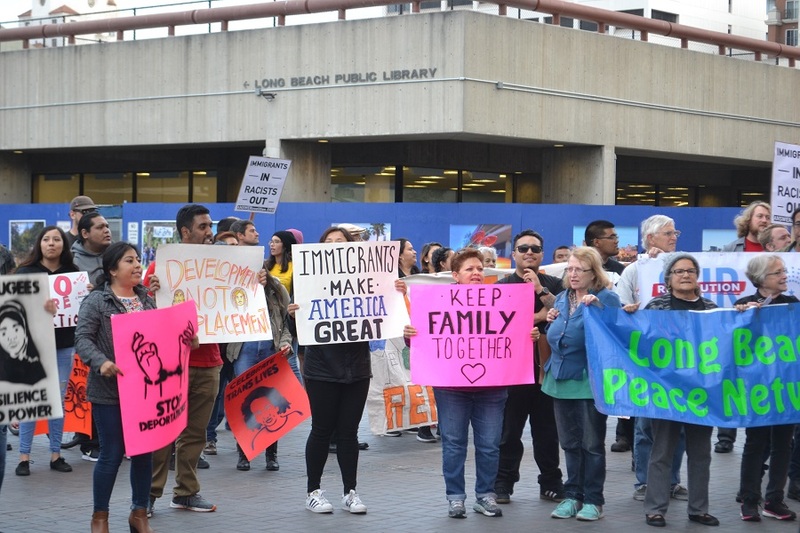 May Day demonstrators march to Long Beach City Hall, May 2, 2018. Photo by Stephanie Rivera. The Long Beach City Council on Tuesday will decide whether the city should partner with a national nonprofit that would oversee a legal defense fund program for local immigrants facing deportation proceedings—a component of a city resolution approved this spring supporting sanctuary city efforts. If the council chooses to enter into an agreement with the Vera Institute of Justice the organization would oversee a defense fund of $250,000 for a two-year period to provide legal representation to low-income immigrants who live or work in Long Beach, according to the city’s agenda item. The city would join a SAFE (Safety & Fairness for Everyone) Cities Network, which includes about 12 cities and counties across the country, including the city of Santa Ana. In a July memo to the City Council, the city manager’s office identified Vera as qualified and the most efficient option since it would initiate and manage the defense fund, including leading the request for proposal process to contract legal service providers. The city would also be able to apply for a $100,000 matching-grant from Vera. In March of this year, the City Council approved the creation of the defense fund as part of the Long Beach Values Act resolution. The $250,000 of one-time funding was approved in September as part of the 2019 fiscal year budget, with $100,000 coming from savings from last fiscal year’s general fund. To be eligible, a person must live or work in Long Beach and have a household income below 200 percent of the federal poverty guidelines. The City Council is also expected to discuss alternatives to Vera, including the Long Beach Bar Association. If the agreement is approved Tuesday, the program’s implementation is expected to begin by early winter of 2019, according to the agenda item. The council will meet Tuesday, Nov. 20 at 5 p.m. inside City Hall, at 333 W. Ocean Blvd.